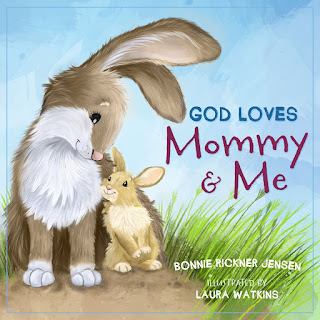 Description: God Loves Mommy and Me will delight your little ones as you read about the sweet connection mothers and their children share. Snuggle up as you look at adorable illustrations of a mommy bunny and her little bunny sharing the day’s adventures, and read about the loving relationship God gives mommies and their children. Little ones revel in one-on-one time with each parent, and the phrase “Mommy and me” is a favorite with toddlers! God Loves Mommy and Me is a celebration of strong, loving mothers, cherished little ones, and the God who loves them all. Perfect for storytime, bedtime, or anytime, this sweet board book celebrates God’s gift of family. Mother's Day is right around the corner and this lovely book is one that would be great to gift an expecting mother to be!! "God Loves Mommy and Me" is a board book but for all ages! The illustrator catches your attention with a cute mommy and child duo of bunnies. The pictures are very sweet and endearing. You all know my favorite job ever is being a mom to my two amazing kids. This book is one that all can enjoy as it reminds you of so many important things like how to forgive them when they make mistakes... or when we as moms make mistakes too!! The book is adorable with its gentle reminders of God's love and how special the bond between mom and child! The author also writes with fun rhymes that make the younger kids really love listening to this book. Purchase this book here for under $8! Make sure you click HERE and go enter this giveaway to win this book for FREE! There will be 5 lucky winners! Such a sweet book very nice review!